In case you need another reason to keep a few bananas around I’ve got one for you right here. Because when life hands you overly ripe bananas – it’s time to crank up the oven and get to baking! And honestly this time of year I’m pretty desperate for any excuse to turn on the oven because it’s just soo freaking cold. As far as baking goes this is one of those recipes that can’t get much easier than this. All you need is one bowl, nine ingredients and about 10 minutes of prep. Start off with three ripe and spotty bananas and smash until almost no lumps remain. Once mashed mix in your wet ingredients: coconut oil and milk. Any type of milk will do so whatever you’ve got on hand works. Stir in your sugar – brown sugar is recommended for a slightly softer, moister bread. That being said I’ve testes this with coconut sugar and it still tastes great. Move on to the dry ingredients: a combination of chickpea flour, tapioca flour, baking powder and cinnamon. The chickpea + tapioca flour combo has quickly become a favourite gluten free flour blend of mine (seen here, here and here to name a few). They’re also incredible flours to use for egg free baking since they’ve got a lot of binding powder between the two of them. After the wet and dry ingredients are fully mixed just stir in your chocolate chips and bake. After about 40ish minutes in the oven you’re all set. Allow the bread to cool for about 10 minutes before slicing and serving. This bread tastes the best eaten the day of but you can keep it for 2-3 days. Just make sure you store it covered or wrapped up nicely to keep it moist. 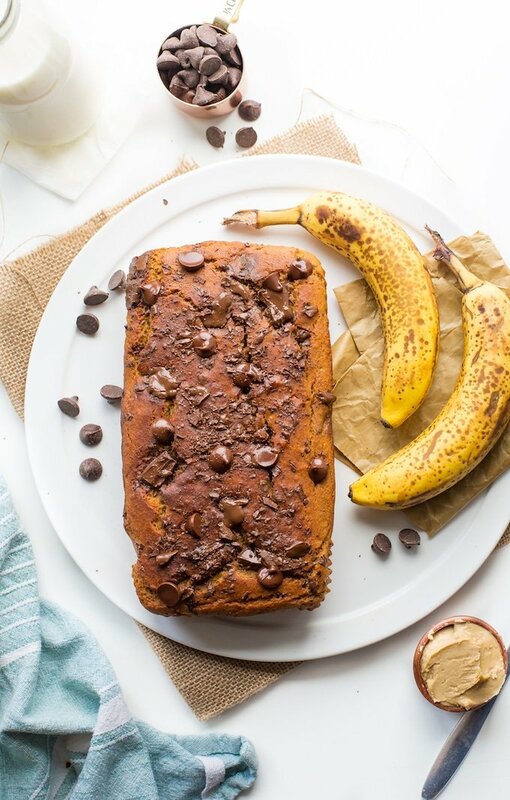 Don’t forget to #asaucykitchen on instagram if you try this Chickpea Chocolate Chip Vegan Banana Bread! We love seeing what you make! You can also post your pictures to my facebook page! Preheat the oven to 350°F/180°C and line or lightly grease a loaf tin. Set aside. Mash your bananas in a large mixing bowl until no lumps remain. Stir in the coconut oil, and almond milk until fully combined. Stir in the brown sugar. Add the chickpea flour, tapioca flour, baking powder, and cinnamon to the banana mixture. Stir until everything is fully incorporated and there are no lumps or pockets of flour. Spoon the batter into your prepared loaf tin and smooth across to evenly distributed. 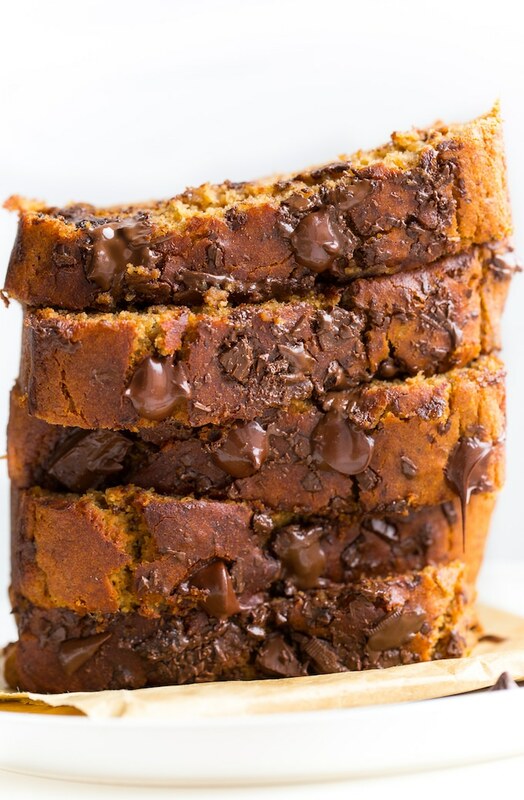 Sprinkle your remaining chocolate chips over the top. Place in the oven and bake for 40-45 minutes or until a toothpick inserted into the centre comes out clean. Let cool in the loaf tin for 10 minutes before removing and transfer to a wire rack to continue cooling. I have not tested this recipe using other combination of flours so I won't be able to make any recommends for alterations here. Yum, so good thanks for this recipe. I substituted tapioca with arrowroot flour and brown sugar with coconut sugar, came out great! So happy to find a good gluten free and vegan recipe! Thanks Jeanie! Glad you liked it! This was a pleasant surprise! I’ve only ever used chickpea flour in savory recipes so I wasn’t sure about using in something sweet. I’m so glad we gave it a try because it was lovely! Thanks for sharing! Hi Erica! I’m so glad you liked it! Thanks for coming back to let me know what you thought! I haven’t tried this using eggs since I made it specifically to be egg free so I’m afraid I can’t really speak to it here. Sorry I couldn’t be more help! I haven’t tried this recipe with arrowroot but I do think it should work well here! Can applesauce be used instead of oil ? Looks delicious! Can’t wait to make this. It’s hot where I am but I still want to try your chickpea vegan banana bread as soon as possible! Those amazing photos are all the motivation I need, I don’t even care about the calories count! Thanks! Thanks Denise! I hope you love it as much as we do! I am on Keto Healthy To Lose Weight, and cannot eat certain ingredients. 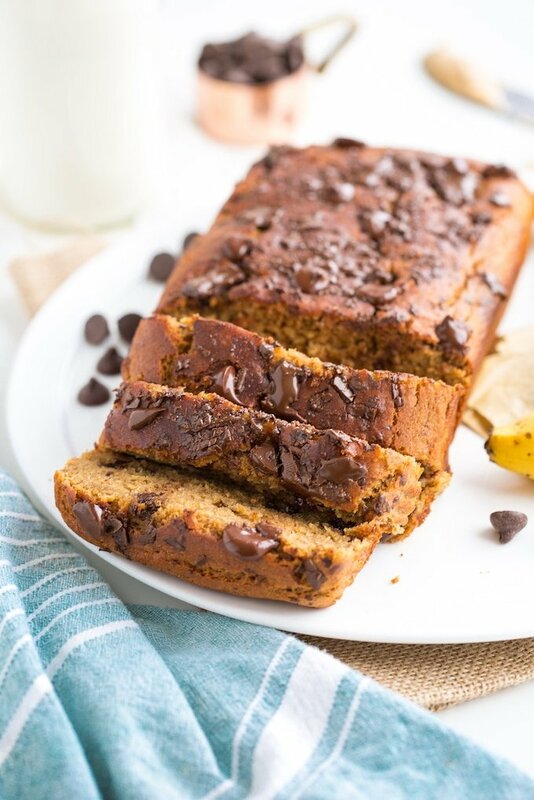 I never used chickpea flour, but this banana bread looks so moist and delicious I simply have to try it soon!